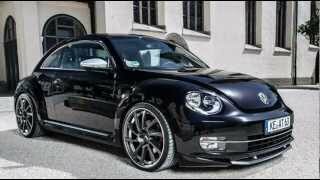 The German tuner ABT Sportsline recently revealed their latest tuning package for the lovable Volkswagen Beetle 2012. The ABT package is quite generous and includes lots of design changes as well as a considerable boost in power. 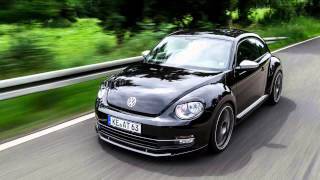 So what does the ABT Sportsline Volkswagen Beetle 2012 has to offer under its bonnet? The standard 2.0 liter Turbo engine has been beefed up from 200 horsepower, to a total of 240 HP. Unfortunately, other data has not yet been revealed and we're not sure how fast the ABT Beetle can go from 0 to 62, or what top speeds we can expect from the tuned model. Nevertheless, 240 horsepower sounds pretty good for a Beetle, especially when you compare it to the 211 HP Mini John Cooper Works or the 160 horsepower Fiat 500 Abarth. Performances aside, the ABT Sportsline Beetle tuning package obviously contains a handful of styling items, including taillight and headlight covers, new front bumper and side skirts, a rear apron with a diffuser, a choice between three sets of wheels: 18, 19 or 20 inch respectively, and a carbon-look decor kit accentuated by red stripes. Furthermore, the ABT package includes two oval ABT mufflers and an ABT brake system with 340 x 30 mm disk brakes and black painted calipers bearing the ABT logo. On the interior the package doesn't make many changes, except for the ABT floor mat set, which are not actually needed to remind you you're driving a 240 horsepower Beetle. 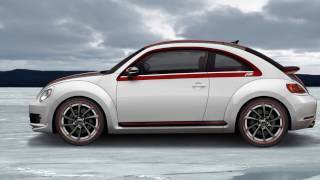 Unfortunately the price for the ABT Sportsline Volkswagen Beetle 2012 has not been revealed yet, but overall, we really like the tuned up Beetle, and we really appreciate the extra power output. The German tuner managed to make it look a bit sportier, but on the other hand, although the front end looks more aggressive now with the new bumper and a couple of headlight covers, the LED "diamond eyelashes" are still present and it kind of reminds you about that time when you've really angered your girlfriend.